Librarians everywhere want to know what their patrons are thinking. Which titles does the public or campus community want added to the collection this year? Are they interested in library instruction workshops? How effective was my library instruction anyhow? Basically, we want to know how we could do a better job with what we are already doing and what we should be doing differently. How do we often get this information? Enter the survey. Many of us already have experience with online survey forms such as SurveyMonkey or Zoomerang. Google Docs Forms are a little different in the way they work. Every form is automatically attached to a Google Docs Spreadsheet, similar to Excel. When someone fills out a form you have created the data they input is automatically populated to Google Docs Spreadsheet where it can then be viewed or manipulated. Why would you want to use Google Docs Forms for surveys? Google Docs Forms are a free part of the overall Google Docs suite of tools. There are no subscription fees to deal with. 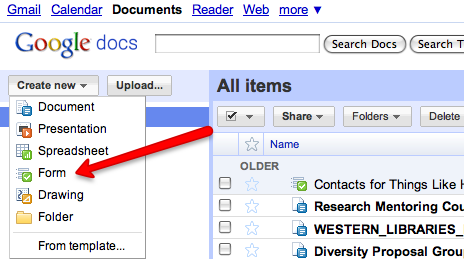 Start creating a form in your Googledoc account by selecting "Create new," then click on "Form." Surveys can be quickly and easily created from an individual account. You don’t have to ask someone else for access to a specialized survey account. Forms can be created and edited by anyone who has a Google account. Forms can be shared with others. Do you have multiple people who need to work with the data collected? You can give access to anyone with an email address to look at and manage data. There are multiple ways in which you can let users access survey forms. You can send a link or you can use the embed code provided to put the survey on your own web page. 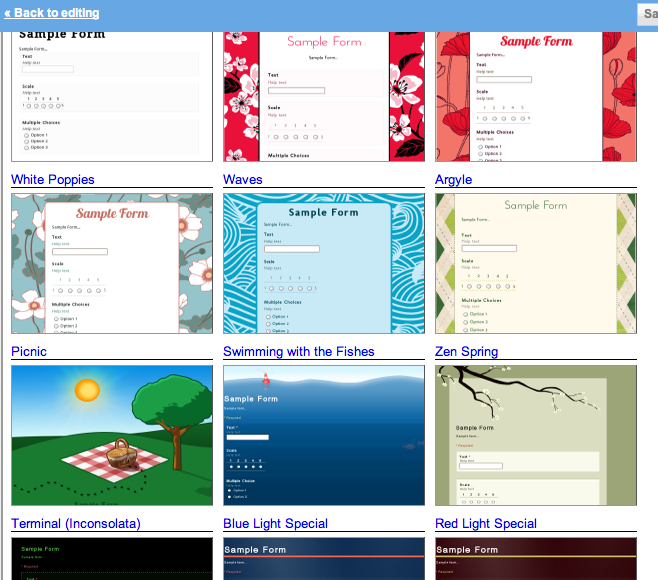 Google Docs Forms have a variety of themes that allow you to change the look and feel of your form. This is especially useful when you are embedding the survey on your own website so that it can match the look of your pages. 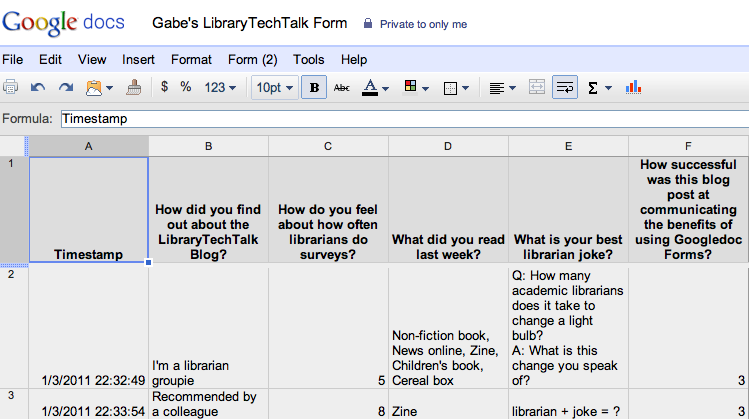 Take a look at and fill out the form I created for this blog post that I embedded on a LibGuide here. The main drawback to Google Docs Forms is that there are less question types to choose from than you would find in some of the other survey tools out there. Personally, in my role as a librarian for distance and off-campus programs, getting feedback from the library users I serve is especially challenging. It is not so easy to drop by and have a chat with them, nor are they likely to visit the physical library very often, if ever. I have found embedding Google Docs Forms on a library website to be a successful way to collect information from students. Because they are so easy to create I have also begun to use forms to organize personal work tasks. For instance, I use a form to to enter data on items I want to look at later for collection development. Google Docs Forms are a great tool to experiment with. I recommend finding a colleague interested in trying it out with you and experimenting together. Click here for a step by step getting started tutorial for librarians. Choose a theme that matches your website or the season. Embed the form on your website where you know your visitors will go. Some editors make it easier to embed the iframe form than others. 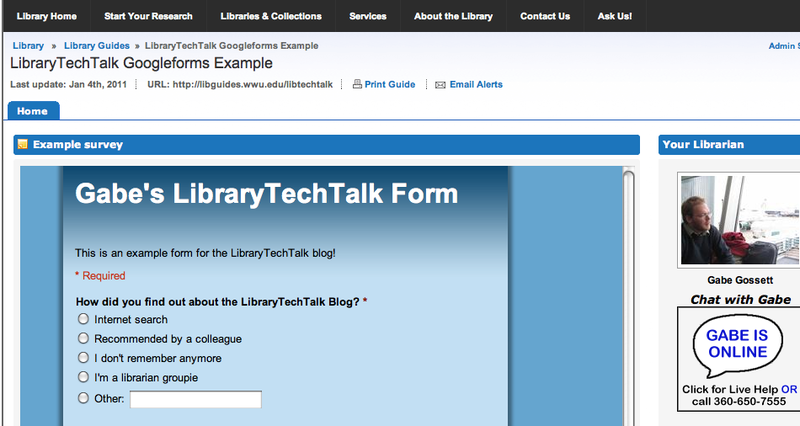 Visit a live example of a form embedded in a LibGuide here. Manage survey results in a Google Docs Spreadsheet. Gabe Gossett is the Librarian for Extended Education and Human Services at Western Washington University. His professional interests include outreach to distance education students, service-learning in libraries, and for-credit library instruction. He is currently immersed in a project to expand the use of LibAnswers reference tracking software to all of the library service desks, teaching an online research skills class, and revising a research mentoring service-learning class. You don’t have to be just a Libtechtalk groupie. Did you know that this blog is looking for guest authors? Contact ctomlinson at towson.edu to find out how you to o can write about your favorite technologies and how they might be used in academic libraries. Can you tell us the librarian jokes from the survey? “Q: How many academic librarians does it take to change a light bulb? Part of the problem I think is that some people may not be seeing the survey since it is only linked to, rather than embedded. I had hoped to have it embedded in the blog post as an example, but it turns out WordPress strips out embedding code. If more jokes come in I will let you know.